ANDREW MOFFAT is a respected figure among liberal-minded teachers. He is the prime mover of a teaching plan called No Outsiders, which aims to raise youngsters’ awareness, from the earliest years of school, of things grouped under buzzwords like equality and diversity. The books, games and discussions that the programme recommends have the stated goal of reinforcing Britain’s Equality Act, which bars discrimination on grounds of race, creed, gender, sexuality and gender change. It is offered on a voluntary basis for use in schools, libraries and parent-teacher groups all over England, and many have taken it up. But this week Mr Moffat and his course were at the eye of a storm in his own workplace, a primary school in a heavily Muslim part of Birmingham where parents are furious over the gay-friendly message. 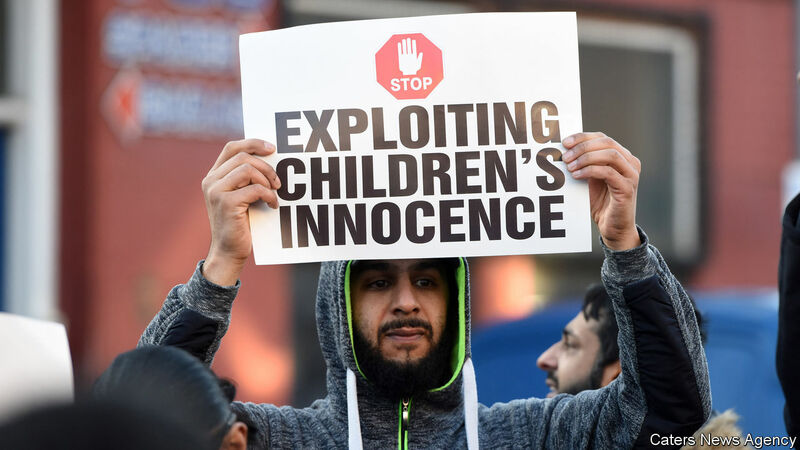 Since early February, there have been demonstrations outside Parkfield Community School, led by mothers who say their children, aged between four and 11, should not be receiving lessons which are out of step with their religious culture. Things came to a head on March 1st when hundreds of children were kept away from school in protest. Mr Moffat, who is assistant head teacher at the school, reports receiving a barrage of abusive messages. Some imply that the teacher who is gay himself, has been using local children as guinea-pigs in an unwanted social experiment. Among the mothers protesting (peacefully) outside the school, the emphasis on the “confusion” suffered by their kids, and the school’s alleged indifference to the religious character of the neighbourhood. “We don’t send our children to school to learn about LGBT. We send them to learn about maths, science and English,” said one, who complained that Mr Moffat “is not respecting our ethos.” The school was encouraged to stand firm by Ofsted, the authority which evaluates schools and has rated Parkfield as outstanding. Amanda Spielman, the agency’s chief inspector, said it was vital for children to be aware of “families that have two mummies or two daddies”. On March 4th the school seemed to be backing down, although it denied having done so. Parents received a letter saying No Outsiders lessons would not be delivered for the remainder of the term, and promised consultations over future lessons. This was widely interpreted as a surrender by the school, but its bosses maintained that they had never intended to organise the controversial classes between now and the spring holidays. The head of the educational trust which runs the school, Hazel Pulley, insisted that the lessons would restart in the summer term. That will continue to be a challenge in Birmingham, where according to the census of 2011, 40% of children were being raised as Muslims, and conservative strands of the faith, such as the Deobandis and the Salafis, enjoy much influence. Next PostNext Why did the “China shock” hurt so much?